The quiet click of an arrow being notched is followed by a muted thud as it embeds itself in a bolt of straw. The sounds carry over the gentle patter of rain drenching the quiet garden in Thalawathugoda where Keerthi and Lalani Wickramarathne run their dojo. Here, the couple teach the ancient martial art of Kyudo and this week they have two very special guests. The 75-year-old Tadashi Ono sensei and his niece Miwako Araie sensei are dear friends and mentors, as well as accomplished practitioners of Kyudo. Dressed in a traditional black hakama, Keerthi sensei strings his yumi in preparation for his practice session. The slender, curving bow is over two metres high and is taller than he. He notches it with arrows made of bamboo, drawing it with a hand wearing a three fingered leather glove known as a yugake. He displays the points on the glove which are dusted with pine rosin powder to keep the arrow from slipping. The bow he is using is made of lacquered bamboo and is worth a tidy sum – as the traditional craftsmen who produce these lovely bows by hand are a vanishing breed. But the introduction of carbon fibre bows is one of the things that have supported Kyudo’s increasing popularity, with many small dojos opening all over the world. Kyudo or simply ‘The Way of the Bow,’ is often dubbed the ‘purest’ of all the Japanese martial arts. 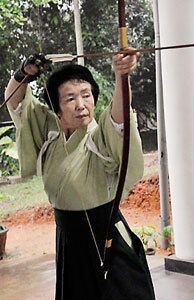 These archers no longer use their bows to hunt or to fight – Kyudo has no room for violence, Ono sensei emphasises. Instead, it has evolved into a process that nurtures spiritual, physical and moral development. Practitioners spend time in meditation before they begin, and the process itself is a quiet, contemplative one. The ultimate aim of Kyudo is attaining the state of shin-zen-bi or truth-goodness-beauty, which melds good attitude and truthful technique together, to result in beautiful shooting. 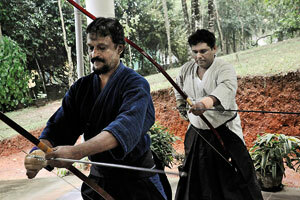 The point, says Keerthi sensei, is to discipline the human character through application of the principles of Kyudo. They begin with a session of makiwara or target practice work, where the distance between the shooter and the bale of straw is a few arm-lengths. Only after this session do they move to the outside practice area where their arrows must traverse approximately 28 metres to find the target. During the process, the men in particular are fascinating to watch as they kneel and free one arm and shoulder from their short-sleeved keiko-gi. They do this one handed, employing minimal movement, while holding their bow in the other hand. The ceremonial aspect, inherent in the process, was perfected when Kyudo practitioners would display their skills in front of the emperor and his shoguns, says Ono sensei. However, when in the act, they do not seem to spare a thought for any observers. Instead, the moments before the arrow is released allow for a purity of focus, an intensity of concentration, all designed to put the analytical mind to rest and allow the practitioner to attain a state of consciousness known as mushin, literally meaning no mind. Ranil Mendis, who is a senior student at the dojo, says his sensei has taught him to attach no emotional significance to whether he strikes the target or not, and instead to strive for calm and equanimity, skills he says serve him well in the world outside the dojo. Keerthi sensei and his wife Lalani sensei learnt what they now teach during a decade spent in Japan. The two have a shared love for the Japanese martial arts and are equally ranked in Kendo, Aikido and Iaido, with Keerthi sensei ahead of his wife only in Kyudo. The two have been teaching in Sri Lanka for nearly 15 years, but it is only last year that Keerthi sensei chose to teach Kyudo full time. Though he had initially travelled to Japan to study electronics, his more recent work has been as a certified gemmologist. It was while in Japan that they had the chance to study with Ono sensei. It was a rare opportunity, Keerthi sensei says now, explaining that outsiders are seldom given such access. He and Lalani sensei would travel 70km northwest of Tokyo to arrive in Chichibu Saitama, a beautiful area ringed with mountains, where Ono sensei lived and taught. (Ono sensei was a priest in charge of a Shinto shrine here which, inherited from his father, he has now handed over to his son.) Ono sensei has spent 55 years of his life as a student of Kyudo. In that time, he says he has gone from being a violent youth to a much calmer and more self-restrained man. He shared the lessons of Kyudo with his students and by 1996 Keerthi sensei had earned a 4 Dan in Kyudo and Lalani sensei a 3 Dan in Kyudo. The former continues to visit Japan regularly so that he can practise for his 5 Dan. The dojo the couple set up in Sri Lanka in 1997, currently boasts over 20 students, many of whom have been with them since the very beginning. The atmosphere in the dojo is one of friendship, togetherness and mutual respect, Keerthi sensei emphasises that anyone, at any fitness level, can learn Kyudo. All that is required is the right attitude and the willingness to learn…luckily at least one of these can be taught. You can find out more by visiting the Kyudo Sri Lanka page on Facebook. Published in the Sunday Times, Sri Lanka on 4 March, 2012. Words by Smriti Daniel. Pix by Susantha Liayanage. 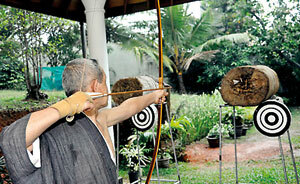 Tags: A couple teach the Japanese martial art Kyudo in Sri Lanka. Bookmark the permalink.